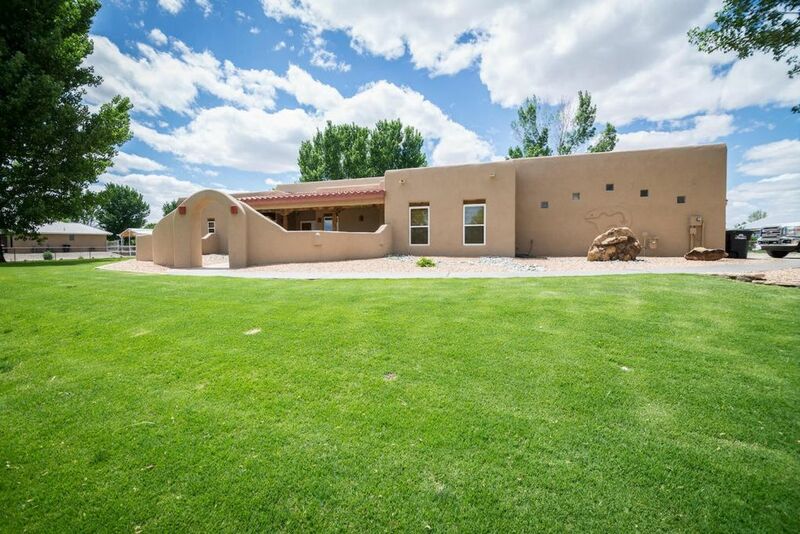 Gorgeous custom home by Spencer Wood w/amazing views on 1.8 irriated acres. Beautiful adobe wall courtyard greets you w/fountain, plants, flowers & covered cedar plank porch. Great Room features herringbone ceiling with vigas, corbels, beams, adobe accents, kiva fireplace, formal dining area & window seat w/storage. Gourmet kitchen w/plenty of Corian counter space & cabinetry, kitchen island, desk for computer, informal dining area. Retreat to the Master Suite w/Kiva fireplace, raised jetted garden tub, glass block snail shower. New stucco & new shutters & blinds 2018. Gardener's paradise w/mature landscaping all on sprinkler & drip system. Grass is low water use & very resilient. Completely pipe fenced. 3-car garage with a 9 ft. garage door. Horses welcome!